Our captain, David Berson holds a 400 ton Merchant Marine Masters License and has been operating sailing and power vessels for more than 25 years. He also teaches celestial navigation classes. As a contributing editor to Ocean Navigator magazine, David challenges readers monthly with a celestial navigation problem that is woven into a sea faring story. David is also the host in the new video "High Seas Schooner." He has been sailing since the early 1970's and has been relief captain of some great sailing ships including the PETREL, PIONEER, HARVEY GAMAGE and OCEAN STAR. David was also the chantey man at the South St. Seaport Museum and has been known to sing a song or two while underway. The combination David's experience and his high standard of safety along with the “green” aspects of GLORY guarantee the most relaxing and safe cruises in beautiful Peconic Bay. Welcome to Greenport Electric Launch Co. owners and operators of GLORY —New York's only electric-powered, non polluting harbor tour boat. 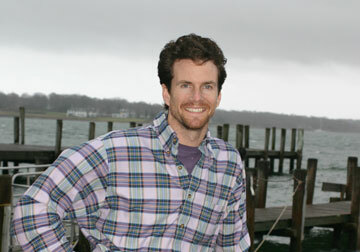 Sixteen years ago, Andrew Rowsom (shown below) and GLORY's Captain David Berson (shown above) wanted to start a harbor tour business in Greenport. Traditionally tour boats have either been diesel assisted sailing vessels or powerboats. Desiring to contribute to the continued well-being of Peconic Bay, in 1999, long before Global warming was a hot topic, Rowsom and Berson took the risky business step of putting into operation the first zero emissions tour boat, certified by the United States Coast Guard, in all of New York. The United States Coast Guard inspects GLORY annually to make certain that the vessel is operating to their highest standards of safety . The captain is subject to stringent testing and has his 200 ton Merchant Marine license reviewed every five years. GLORY is outfitted with redundant fire-fighting, and bilge-pumping equipment and has sufficient number of life-jackets. We are proud to say that in 16 years of operation GLORY has an unblemished record of safety. GLORY is the safest, “Greenest” way to enjoy getting out on the water. Now celebrating GLORY's 16th year anniversary, Andrew and David are still at the job of exposing guests to the quiet joy of electric powered boats. Come for a cruise and see what all the fuss is about. Max, (Maximillion, Maximus III) an AKC Champion Bichon Frise, has been sailing with David aboard GLORY for the past 10 years. In addition to his duties as second mate, Max attends to GLORY's guests. Passengers are apt to find this mop-headed fur ball cuddling up next to them as GLORY purrs its way along the bay. Because Max is hypo allergenic, guests with dog allergies need not be concerned. Max is extremely gentle, and quite stoic. It is still unclear as to whether he enjoys the boating experience or not. 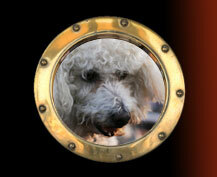 Did you know that Bichons have a long nautical history? Spanish sailors in the 18th century would bring Bichon's with them when they made passage to the Canary Islands. Apparently, the fair ladies of those islands looked very kindly upon any seaman who presented them with a Bichon as a gift!